Prettier in person. It came today and is more well made than I thought. This beautiful water color style lilac floral bathroom accessory set is available as a set or in individual pieces. 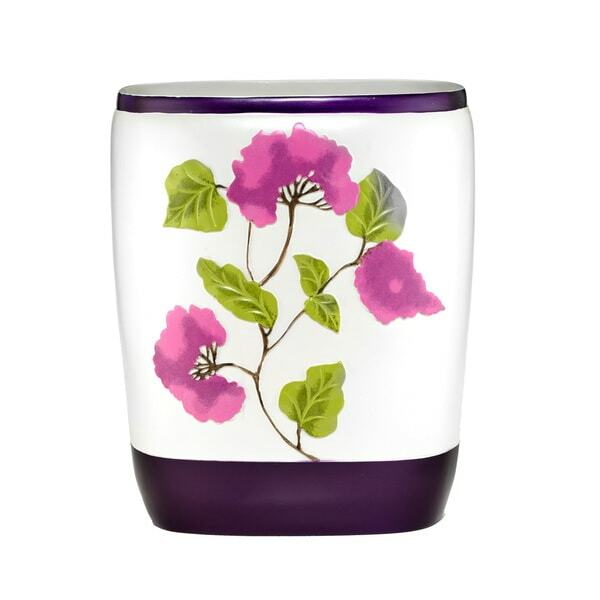 Stunning purple flowers and green vines against a white background create a hand painted look. I bought this tumbler for my bathroom. I've been trying to find one that matches my shower curtain and bathroom accessories. The purple and green matches perfectly. I bought the toothbrush holder and the towels to match. I really like the design of this product and the color. Love be this ! Looks great in our bathroom and we also purchased tissue cover and toothbrush holders. They look gorgeous! Smaller than I expected. I don’t understand why this accessory is ceramic yet other pieces to the set are plastic. I feel this whole thing is a rip off!!! I will be filing a complaint with the better business bureau. This set is much too expensive for this nonsense. I bought it to compliment the water color lilac shower curtain and it matches perfectly. It's a nice size and seems like it will last for awhile. Very cheap towel set. The towels are cheaply sewn. DO NOT WASTE YOUR MONEY. Purchased most of this set and I'm sad to say it is not well made. The shower curtain and hooks are very nice, along with the 3 piece towel set. These are attractive and look very nice . Sadly the quality is not there. The towels are okay but the rugs are very thin and show some spots where you can see lack of material. Love the trash bins.. match perfect with color scheme. Bought this to match shower curtains! Absolutely perfect!! "I only want 2 sets of the Bath towels and when i go to place my order they are not listed"
At this time we do not have in stock bath towels that are designed for this collection. "How can I order the tissue box container?" Unfortunately, we are currently out of stock with the tissue box container. We hope to restock this item if it becomes available again. I liked the colors and thought it would work well in my bathroom.